Have you ever had opportunities pass you by when you could have made a difference if you had just known how to reach the abortion minded person – a relative, stranger, or friend? Well, then, this is for you! If you’d like to see a training in your area, please contact johanna.coughlin@archbalt.org. We would need a good date, a room with tables, and a TV/DVD player. We can provide the materials, refreshments, and speaker. 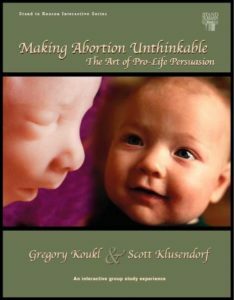 Through Pro-life Apologetics Training (Pro-life 101) using part of the “Making Abortion Unthinkable” DVD series from Stand to Reason, attendees will receive a comprehensive and practical guide to presenting the facts about abortion and why it should be outlawed in a peaceful, charitable, rational and intelligent way. It will show how to answer common objections in a respectful way, in order to convince pro-choice people that abortion is wrong. small fee includes training binder and refreshments. Appropriate for all adults and mature high school juniors and seniors. Please RSVP to johanna.coughlin@archbalt.org or (410) 707-9842.